An injury to the MCL may occur as a result of direct impact to the knee. An MCL injury can result in a minor stretch (sprain) or a partial or complete tear of the ligament. The most common symptoms following an MCL injury include pain, swelling, and joint instability. An MCL injury can be diagnosed with a thorough physical examination of the knee and diagnostic imaging tests such as X-rays, arthroscopy, and MRI scans. X-rays may help rule out any fractures. In addition, Dr. Patel will perform a valgus stress test to check for stability of the MCL. In this test, the knee is bent approximately 30° and pressure is applied on the outside surface of the knee. Excessive pain or laxity is indicative of medial collateral ligament injury. If the overall stability of the knee is intact, Dr. Patel will recommend non-surgical methods including ice, physical therapy, and bracing. Dr. Patel will make an incision over the medial femoral condyle. In the first two weeks after the surgery, toe-touch and weight-bearing is allowed with the knee brace locked in full extension. 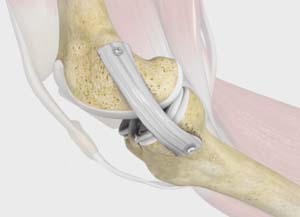 After 2 weeks, 0° to 30° of motion is allowed at the knee. At 4 weeks, knee flexion is allowed from 60° to 90° of motion and full weight-bearing is permitted. At 6 weeks, the brace is removed, and you are allowed to perform full range of motion. Crutches are often required until you regain your normal strength.